It’s so hard for me to believe that the events of 9/11 occurred 14 years ago. It still feels so raw. And whenever Robert and I are watching a movie or a TV program where the Twin Towers still fill the New York City skyline, a jolt of sadness and regret and many other thoughts and emotions go through my mind. Not the least of which is prayer for the souls taken in the attacks. How our world and our security have changed since those unspeakable events in NYC, at the Pentagon, and on Flight 93. This morning’s New York Times website features the article “Tribute in Light Captures Grief and Joy of 9/11 Anniversary” by David W. Dunlap, with an interesting short video (2:49 min) which I hope you’ll watch. Mr. Dunlap’s article also has links to the 9/11 Memorial Blog, written and produced by 9/11 Memorial staff. “Six months after the Twin Towers fell, they returned in the form of two blue beams of light illuminating the Manhattan skyline. Since then, they have lit the sky annually as a Sept. 11 commemoration known as Tribute in Light. The tradition will continue this year to remember the 14th anniversary of the attacks. Tribute in Light first debuted on March 11, 2002 in a vacant lot across from ground zero on West Street. Now, the 88 high-powered light bulbs, which are assembled in two 48-foot squares to echo the footprints of the original towers, are illuminated from the roof of a lower Manhattan parking garage. In 2010, as seen from Brooklyn. 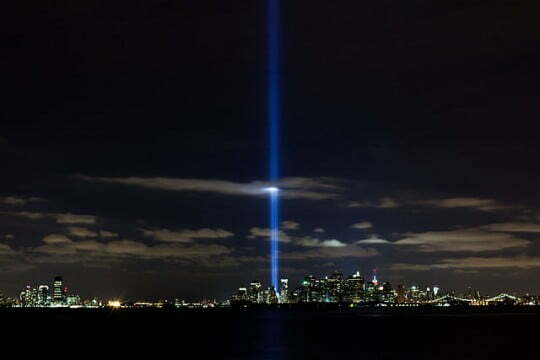 “NYC World Trade Center Tribute in Light 2010” by MarineCorps NewYork from New York City, USA Sgt. Randall A. Clinton/Division of Public Affairs – World Trade Center lights NYC sky on 9th anniversary of attacks. Licensed under Public Domain via Commons – https://commons.wikimedia.org. To fully appreciate the awesome beauty of this tribute, click the image for full size view. I somehow missed Emily Classon’s pattern, YAH, last year. 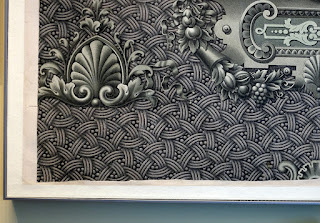 Now I notice (from following it in the Tangle Refresher 111) that it is very close to a pattern I have been trying to create from Rick’s and Maria’s photos at the V & A in the Monday, August 10, 2015 blog. Hi Linda, I understand exactly what you are saying about the jolt of sadness. I feel it too, even from here in Australia. And watching again the footage from that awful morning, I still struggle to come to terms with the level of anxiety and panic which those poor souls were feeling, it brings tears to my eyes, even to this day. Bless them all.